Many of us who love sports started playing as youngsters, continuing our love affair with a particular sport into our adult lives as a player and/or coach. But few of us wind up making what we love our career. 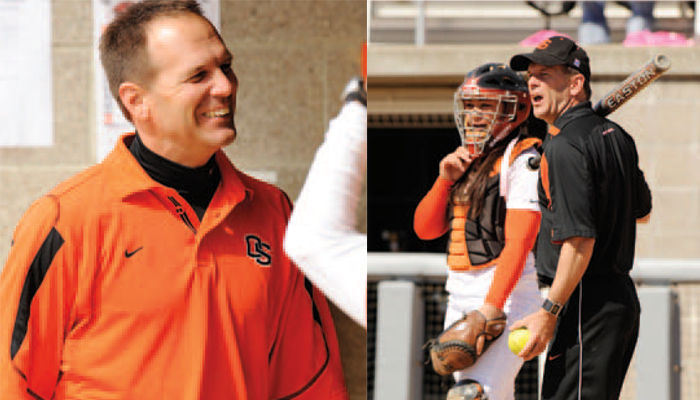 One of the lucky ones who does what he loves every day is Kirk Walker, head coach of the Oregon State University (OSU) women’s softball program for the past 18 years and a member of Compete’s Advisory Board. According to the university’s athletic website, “Walker reigns as Oregon State’s all-time winningest softball coach with a 558-467-3 career record. He earned his 500th career coaching victory on March 1, 2009, in a 4-1 decision over Minnesota at the CSUF DeMarini Invitational, hosted by Cal State Fullerton.” And what makes the story of this NCAA Division I coach all the more remarkable is that he is openly gay. C: We are so excited to interview you, Kirk. You are not only an NCAA Coach at a PAC-12 school, you have also been a coach with the Amateur Softball Association (ASA), the 2004 Olympic USA National Softball Team, the USA Elite Team for three summers, you’ve presented at a number of clinics and camps, been involved in publishing and video projects, and even been a co-owner of a softball school. And I’m sure I’ve only hit the surface. How have you managed to pack so much into such a short career? KW: Well, I’ve been coaching for 30-years so it’s not such a short career. I was fast and agile growing up and I loved sports, playing soccer, track, football and baseball. My younger sister loved softball so in addition to me playing sports, I started going to softball practice with her and began coaching her while I was only in my mid-teens. She eventually played softball competitively with the ASA. Then when I started college at UCLA (with the intention of going to medical school), I connected to their women’s softball program through a coach I knew and began to attend all their practices and coach in the first semester of my freshman year. In January I was asked to adjust my schedule so I could travel with the team. And by June the head coach wanted to put me on a total scholarship starting in my sophomore year. By my junior year I was a full-fledged coach and decided to switch from medical school to physical therapy. When I graduated I had two choices—first, as a graduate assistant in neuro-physiotherapy or second, as a full-time coach. C: And your choice was…? KW: I decided to take the full-time coaching position, staying at UCLA for six-years until I was recruited by OSU. And I’ve spent the last eighteen years there building their women’s softball program. C: You’re head coach of the women’s softball program but have you ever coached any men’s softball teams at any point in your career? KW: No, I’ve always coached women’s teams. I didn’t plan it that way. But starting with my sister and her teams, my coaching associations along the way always seemed to be with women’s softball. C: Since OSU says you’re their “all-time winningest softball coach,” how does the season look for you? KW: We’re half-way into the season and just starting conference. At 21-7, we have a very strong pre-conference season and are ranked 26th in the country based on the polls. I’m excited for conference but everyone there is top 25. I’m hoping to be in the top 25 in the end and going into the NCAAs but we still have a lot we need to do. C: You’ve twice been named as a Pac-10 Conference Coach of the Year. Has the change from membership in the old Pac-10 conference to the new Pac-12 affected your program in any way? KW: It’s really had little impact on the Beavers. The Pac-10 only had eight schools that had softball as a required charter sport, and when the University of Colorado at Boulder and the University of Utah joined to make it the Pac-12, only one more softball program was added. C: Sports is one of the last bastions where homophobia isn’t simply tolerated, it’s almost expected. As a gay man, how did you get to where you are today? Were you always open to employers about being gay over your 30-year career? KW: I wasn’t out during most of my career. What prompted me to come out publicly was the decision my partner and I made to be part of an adoption pool. I knew the word would get out and I was worried my team members and other close friends would be hurt by learning it from someone other than me. So in 2005 I told my softball team and some other friends about being gay so there would be no hurt feelings. At that time my friend Cyd Ziegler, founder of Outsports, did a story on my coming out and it had a landslide effect that, for me, was totally unexpected. Immediately I began getting lots of calls from all over the country for interviews. My story was picked up by the local Portland paper, the NY Times, ESPN and the NY Daily News—Logo even wanted to film a new series based on it. C: Given all that intense media interest in you, how did the university respond to your coming out? KW: The administrator in the Provost’s Office was super excited about the news and encouraged the publicity. He really wanted me to become a banner carrier for the school as a place that was open and accepting of LGBT individuals. I never intended my coming out to be used as a public example for others so it left me a bit overwhelmed. As I look back now, I’m a little embarrassed by some of what I said. C: Did you wind up experiencing any homophobia as a result of OSU’s enthusiasm to make your story public? KW: All-in-all, I feel I haven’t experienced homophobia from any of the university departments, at least not overtly, but I’ve not had an open dialogue with anyone about it. I’ve never had any direct conversations with other coaches about my being gay but I’ve also not felt any outward negativity from them. In fact, I got hundreds of emails once I went public, one of which came from a coach in the Midwest who was struggling with his own decision to come out. C: Do you see yourself as an LGBT game-changer, then? KW: Maybe tangentially, but it’s not my place to directly change anyone else’s mind about being gay. However, I do see myself as a catalyst for changing minds and opinions and I’m now comfortable with that role. When I came out in 2005, I didn’t do it to gain personal publicity or to make a statement about being gay. Although it didn’t occur to me when I was swept up in the media whirlwind, I now realize that I’ve become part of a larger support system for others in sports who want to come out. C: What has being part of that support system entailed for you? KW: Part of what surprises me is that my coming out story, even though it’s now six years old, is still considered newsworthy. And I now realize why that is the case. Here’s a good illustration. In April 2011 the LA Daily News ran an article on me, stating that I bring hope to the gay and lesbian community. Rick Welts, now the president and chief of operations for the Golden State Warriors, is a good friend of mine. He reached out to me while he was in the process of deciding whether to come out quietly or to share his story with the public. He told me that he continually carried that LA Daily News article in his pocket because it gave him the courage to follow my example. He wanted his story to offer courage and support to someone in turmoil just like mine had helped him when he was trying to decide how to make his announcement. That’s pretty powerful! C: Had you been open about your sexual preference to anyone prior to 2005 or were you trying to keep it a secret? KW: I probably knew I was gay by the time I was 12 or 13 years old but I really didn’t come out to myself and others until I moved to Oregon. I wasn’t hiding the fact that I’m gay but I also didn’t feel the need to share that information with everyone. I was always too busy with sports to even do much dating. C: Obviously you have a partner since the two of you entered an adoption pool, a clear sign that you wanted to become parents. What are you willing to share with our readers about your personal life? KW: My partner, Randy Baltimore, and I live in Portland. We have a wonderful little girl, Ava, who will be six in July. Randy and I began dating in 1998-99 and eventually moved in together. In late 2005 we began paperwork for an open adoption, the action that prompted my coming out. We were on a wait list for nine months before we got the exciting call that Ava was being born. We were able to take her home right from the hospital. C: How has Ava changed your life? KW: We live a crazy life—she’ll be six in July and she’s already into gymnastics and karate. This year she attended kindergarten. One of my former players is her nanny and prior to kindergarten she attended a nice daycare program so she’s very well socialized. We love being parents! C: What, if any, surprises has parenthood brought you? KW: I’ve been surprised to realize how coaching has affected my parenting. KW: After you’ve been coaching for awhile you start to realize that there’s a consistent cause and effect pattern of behavior in people. Once you see trends forming you know when and how to step in with corrective measures. The only difference between the classroom and the competitive environment is the fall-back behavior individuals use when they’re under pressure. All my years of coaching experience has made it much easier for me to quickly recognize Ava’s behaviors and the best way to address them when correction is needed. C: After 30-years of coaching, do you have a retirement date in mind? KW: Not really—I still love coaching and I’ll continue doing it until my passion for it runs out. But I do find that as I get increased feedback from the LGBT community from those that I’ve helped in some way to address their own struggles, my passion for working with the LGBT community is growing. I’ve been working on campus with the Pride center and office of student affairs to bring some speakers to campus. Jay Michaelson, author of God vs. Gay? The Religious Case for Equality, is coming in April and Hudson Tayor of Athlete Ally is coming for pride week. I’m excited to be more active on campus. I’m also excited for the LGBT Sports Summit happening in June at Nike. It should be really informative and productive. Gay people in the athletic community have so many fears about coming out. But being an athlete is so much greater and more important than simply a person’s sexual orientation. And I think when people reflect on that, they’re able to respect what a person, whether gay or straight, brings to the game. I’m happy being part of that system that supports other sports people coming out. Bottom line? Keep checking in with me.